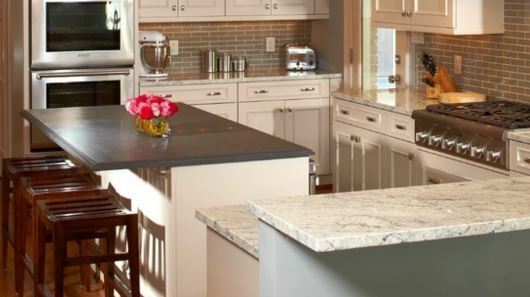 Choosing the right kitchen countertops can be a tricky and expensive decision. Before spending the big bucks on a new kitchen countertop, let’s explore a couple of the popular materials and recommendations. Beckworth LLC can help you choose the best design and style for your home and lifestyle. Your kitchen countertops should accommodate your meal preparation needs and also reflect your own personal style. There are some pros and cons associated with different selections of countertop material. Here are a few of the common kitchen countertop selections people typically come down to in the decision-making process. These can be eco-friendly countertops sourced from recycled paper and other materials making them an excellent choice for environmentally concerned individuals. Although these sometimes require sealing, their stain, heat and scratch resistant qualities are impressive. A more desirable but expensive option is natural granite, which serves as a beautiful heat and stain resistant surface. This can require an annual re-resealing to ensure resilience and stain fighting properties. Attractive alternatives to real stone are engineered stone countertops, which are catching up to natural granite in popularity. Alternatively, you can go more retro with classic butcher block style countertops. Beyond granite, there are a multitude of countertop options available and their number just increases over time. If you’re in the market for a kitchen makeover, you may find one of these great, non-granite surfaces is just what you need. You will also want to consider remodeling your cabinets at the same time so you don’t have to have a separate remodel performed later. These are just a few of the options we can explore with you for your next kitchen remodel or countertop installation. Beckworth LLC is a team of skilled professionals at remodeling and interior design so feel free to ask us for a free in-home estimate.